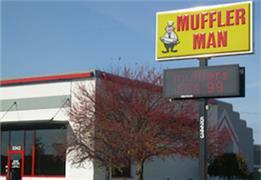 Welcome to Muffler Man, a full-service preventive maintenance and automotive repair center. We perform high quality, guaranteed service you can trust at a fair price. We repair domestic and foreign vehicles and are your best choice for scheduled maintenance of your vehicle. With four locations, Muffler Man will get you back on the road quickly! We only use quality replacement parts, and our technicians are ASE-certified. At Muffler Man, we pride ourselves on not only delivering the best results at the most competitive prices, but on your TRUST and CONFIDENCE in our service! Call us at one of our four locations to schedule an appointment!